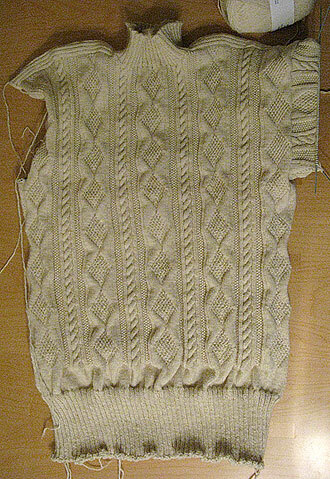 With the feeling of an intrepid mountaineer – or a middle-aged, flabby and desperately unfit person who occasionally strolls to the shops for a paper – who reaches what looked like the summit, only to find another twenty miles of jagged rocks to haul himself up – I have finished the body, and am now faced with the sleeves. 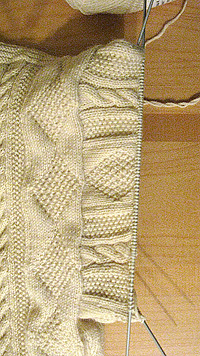 The neck was a breeze, or should have been, picking up the stitches from the front, back and shoulders and knitting a basic rib of knit 2/purl 2 until your fingers (and brain) grow numb, or you reach the requisite couple of inches. 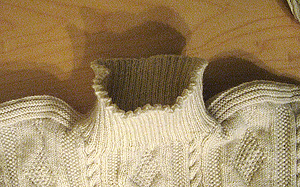 As it turned out, I got carried away by nostalgia and decided to recreate an authentic traditional collar (which was finished off by a couple of rows of purl stitches on top of the ribbing, then a couple of rows of knit, and then casting off). Well, it looked horrible, all squiggly and uneven, like a clam’s lips, and after having it staring at me from across the room like a mad scientist’s experiment gone wrong, I called in armed backup and got Margaret to rip it out, and finished it off again by casting off in the rib pattern. Much better. 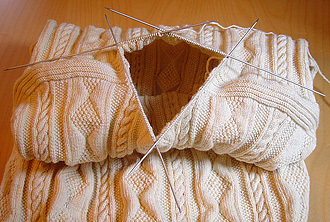 Getting the sleeve underway is officially the Worst Part of the Pullover, and usually requires a period of fasting and meditation to prepare you for the horrors to come. Picking up all those stitches is a real slog for those of us with unartistic fingers, and when there’s almost 200 of them per sleeve you just have to wrap a wet towel round your head and draw the curtains and get it done. (But, of course, it’s still better than sewing! ).